Here, a method that enables quick, efficient, and inexpensive preparation of polyacrylamide gels in a multiwell plate format is described. The method does not require any specialized equipment and could be easily adopted by any research laboratory. It would be particularly useful in research focused on understanding stiffness-dependent cell responses. Syed, S., Karadaghy, A., Zustiak, S. Simple Polyacrylamide-based Multiwell Stiffness Assay for the Study of Stiffness-dependent Cell Responses. J. Vis. Exp. (97), e52643, doi:10.3791/52643 (2015). Currently, most of the in vitro cell research is performed on rigid tissue culture polystyrene (~1 GPa), while most cells in the body are attached to a matrix that is elastic and much softer (0.1 – 100 kPa). Since such stiffness mismatch greatly affects cell responses, there is a strong interest in developing hydrogel materials that span a wide range of stiffness to serve as cell substrates. Polyacrylamide gels, which are inexpensive and cover the stiffness range of all soft tissues in the body, are the hydrogel of choice for many research groups. However, polyacrylamide gel preparation is lengthy, tedious, and only suitable for small batches. Here, we describe an assay which by utilizing a permanent flexible plastic film as a structural support for the gels, enables the preparation of polyacrylamide gels in a multiwell plate format. The technique is faster, more efficient, and less costly than current methods and permits the preparation of gels of custom sizes not otherwise available. As it doesn’t require any specialized equipment, the method could be easily adopted by any research laboratory and would be particularly useful in research focused on understanding stiffness-dependent cell responses. Several promising high-throughput hydrogel technologies have been developed, including PEG-based microarrays,13 microfluidic devices for the production of agarose hydrogel microbeads,14 or micro and nano-rods where stiffness is modulated by the diameter and height of the microrods.15 However, the technologies to prepare such substrates are sophisticated and available to limited number of laboratories. Much research involving stiffness modulated cell responses utilizes polyacrylamide (PA) gels which are not only inexpensive and simple to implement, but also exhibit a physiologically relevant range of Young’s modulus, namely 0.3 – 300 kPa.16-22 However, existing methods to fabricate PA gels for cell culture are labor intensive and consequently prepared in small batches. Some of the difficulties associated with the preparation of PA gels as cell substrates stem from the requirement that the gels have to be prepared: 1) in the absence of oxygen to allow complete polymerization, 2) with a flat and smooth surface to permit uniform cell attachment and spreading, and 3) permanently affixed to the bottom of the cell culture dish to prevent floating. Several groups have attempted to produce PA gels for cell culture in large batches. Semler et al. prepared thick sheets of PA gels which were then “cut” with a hole punch and placed into 96-well plates.23 However, this method is limited to stiffer gels, i.e., > 1 kPa in Young’s modulus, because softer gels are “sticky”, difficult to cut, and easily damaged. Mih et al. developed a more sophisticated technique which allows the gels to be directly polymerized in a glass-bottom multiwell plate.6 This was achieved by pouring the gel solutions into functionalized glass-bottom plates and forming gels by “sandwiching” them with a custom coverglass array.6 Even though very promising, slight edge effects were still observed with this technique. Additionally, the technique requires a custom-designed array not immediately accessible to many laboratories as well as costly glass-bottom multiwell plates. This paper describes a simple and inexpensive way to assemble PA gels in a multiwell plate that could be easily adopted by any laboratory. Here, a flexible plastic support is utilized, which has two sides — a hydrophobic one, which is repellent to PA gels, and a hydrophilic one, which covalently binds the PA gel upon deposition. Once PA gel sheets are deposited and permanently affixed to the flexible plastic support, it enables handling gels of any thickness or stiffness and cutting them into any desired shape. This approach not only produces custom plastic ‘coverslips’ in sizes not otherwise commercially available, but also obviates the necessity to pre-treat glass surfaces, either glass coverslips or the wells of costly glass-bottom multiwell plates, with a PA binding solution, which is a tedious and a time-consuming step. Lastly, uniform PA gels sheets can be prepared in large batches and stored de-hydrated for several months. In summary, the assay presented here is an improvement over existing methods in several aspects. First, the process of multiwell plate assembly is efficient, and the overall cost of the required materials is low. Second, the hydrogels are produced in large batches in a single homogeneous gel film. Finally, only materials that are commercially available are required. The utility of the assay is illustrated by exploring the effect of substrate stiffness on cell morphology and spreading area. Preparation of polyacrylamide gel precursor solution. Prepare polyacrylamide gel precursor solution by mixing acrylamide (A) (40% w/v, Mr 71.08 g/mol), the crosslinker bisacrylamide (B) (2% w/v, Mr 154.17 g/mol), and de-ionized water in the volume percentages specified in Table 1. NOTE: These solutions can be prepared in large batches and stored at 4 °C for up to several months. CAUTION: Acrylamide is toxic upon inhalation or ingestion, particularly, when in powder form: thus, preferably use 40% w/v solution to reduce toxicity risks. Handle only while wearing protective clothing, such as gloves, goggles, and a lab coat. Store in a light-resistant, tightly closed container in the fridge (<23 °C, well-ventilated area). CAUTION: Bis-acrylamide is toxic upon inhalation or ingestion, particularly, when in powder form: thus, preferably use 2% w/v solution to reduce toxicity risks. Handle only while wearing protective clothing, such as gloves, goggles, and a lab coat. Store in a light-resistant, tightly closed container in the fridge (<4 °C, well-ventilated area). Preparation and usage of N-Sulfosuccinimidyl-6-(4'-azido-2'-nitrophenylamino) hexanoate (Sulfo-SANPAH, Mr 492.40 g/mol) aliquots. CAUTION: Sulfo-SANPAH causes serious eye irritation; handle with gloves and proper eye or face protection. Store at -20 °C upon receipt and prior to aliquoting. To store sulfo-SANPAH: dissolve Sulfo-SANPAH in dimethylsulfoxane (DMSO) at 50 mg/ml. Aliquot the stock solution into 50 micro centrifuge tubes of 20 μl per tube. Flash freeze on dry ice or in liquid nitrogen (an optional but preferred step to preserve maximum crosslinker efficiency) and store at -80 °C. NOTE: The aliquots can be stored for several months. To use sulfo-SANPAH: thaw the aliquot briefly and dilute in 480 μl of de-ionized water. Use immediately. Sulfo-SANPAH hydrolyzes quickly in water: therefore take caution to perform all of the above steps quickly. Preparation of ammonium persulfate (Mr 228.18 g/mol) aliquots. NOTE: Ammonium persulfate causes eye, skin and respiratory irritation. Wear appropriate personal protective equipment when handling. Handle ammonium persulfate powder in a chemical fume hood. Store powder in a dry, well-ventilated place. Once aliquoted, the dilute solution could be used on the work bench. Dissolve ammonium persulfate in deionized water to achieve a final ammonium persulfate concentration of 10% w/v. Aliquot and store at -20 °C. Thaw immediately prior to use. Preparation of Collagen Type I solution. Prepare 0.2 mg/ml collagen solution by diluting the stock solution in 1x phosphate buffered saline (PBS) of pH 7.4. Store on ice briefly or use immediately upon dilution. Preparation of hydrophobic glass slides. Place a few drops of a hydrophobic solution on a glass plate and use tissue paper to spread across the surface. Let air dry and wipe with a tissue paper again to even out the hydrophobic coating. NOTE: Store hydrophobic solution in a flammable cabinet at RT. Wear personal protective equipment when handling. Work in a well-ventilated area. Preparation of flexible plastic support. Cut the flexible plastic support to match the size of the hydrophobic-coated glass plate. Mark the hydrophobic side of the flexible plastic support by lightly scratching the surface with a sharp tool such as a scalpel. NOTE: Once the gel — which is fully transparent — dries, the scratch marks will help distinguish which flexible plastic support side contains the gel. NOTE: The flexible plastic support has a hydrophobic and a hydrophilic side. Once deposited, polyacrylamide permanently adheres to the hydrophilic side of the plastic support which facilitates easy subsequent hydrogel handling. Gel Preparation (example volumes are given for 5 ml gel precursor solutions). NOTE: 5 ml would be sufficient to produce ~40 gels when the gel initial thickness is 0.5 mm. More gels can be produced if the gel thickness is reduced. Place 4972.5 μl of polyacrylamide precursor solution of desired final concentration (Table 1) into a 50 ml conical tube. Place in a degassing chamber for 30 min with the cap opened. NOTE: Oxygen acts as a free radical trap and when present, it inhibits polymerization. Add 25 µl of 10% w/v ammonium persulfate (refer to point 1.3) to achieve a final ammonium persulfate concentration of 0.05%. Add 2.5 µl of N,N,N’,N’-tetramethylethylenediamine (TEMED, Mr 116.24 g/mol) to the degassed gel solution to achieve a final TEMED concentration of 0.5%. NOTE: Store TEMED in a flammable cabinet at RT. Handle in a chemical fume hood when wearing appropriate personal protective equipment. Keep tightly closed under inert gas, as it is highly air and moisture sensitive. Mix the solution gently by pipetting up and down 3 – 5 times. Do not vortex to avoid oxygen diffusion into the gel precursor solution. Pipette the gel solution onto the hydrophilic side of the flexible plastic support and sandwich with hydrophobic-coated glass slide. Separate the two slides with silicone spacers of desired thickness (e.g., 0.5 mm). Leave a small amount (~100 μl) of polymer precursor solution in the 50 ml conical tube to use as an indicator of gelation. NOTE: Any spacer could be used. For example, a single strip of Parafilm gives a final swollen gel thickness of 100 – 120 μm. Place another glass plate atop the flexible plastic support/gel sandwich to ascertain an even hydrogel surface upon polymerization. Let the gel polymerize for 45 min, although less time can be used for gels of higher % wt if desired. To ascertain that the gel has polymerized, observe the remaining solution in the 50 ml conical tube; if the remaining solution has gelled, then it is likely that gelation on the glass plate has been initiated as well. However, note that premature opening of the mold will prevent complete polymerization. Once the gel is formed, peel off the flexible plastic support with the covalently attached polyacrylamide gel on top, and set gel-side-up to air dry. NOTE: Convection or heat drying can also be used to accelerate this step. Once dried onto the flexible plastic support, the gel can be stored indefinitely. Mark any bare spots of the flexible plastic support, where polyacrylamide gels did not form due to bubbles. Mark while the gel is still hydrated as this will blend in with the flexible plastic support once the gel is dry. Once dried, cut PA gels into desired shapes. For a 96-well plate, use a heavy-duty hole punch with a diameter of ~6 mm. Use a heavy-duty paper cutter to cut gels into square or rectangular shapes. Alternatively, use scissors. Prepare approximately 500 μl of PDMS per 96-well plate according to the manufacturer’s instructions. To glue the gels to the bottom of a multiwell plate, place a small droplet (~5 μl) of polydimethylsiloxane (PDMS) at the center of the each well. Using forceps, place one polyacrylamide gel in each well, flexible plastic support side down. To allow PDMS to cure, leave the assembled plate at 37 °C for a minimum of 4 hr. Collagen coating of polyacrylamide gels. With a transfer pipette, place a small amount (7 – 8 μl) of sulfo-SANPAH (refer to point 1.2.2) in each well and swirl from side to side to coat the gel surface evenly. Work promptly since sulfo-SANPAH is not stable in water. Place the well plate under a high intensity UV lamp (intensity = 37 mW, λ = 302 – 365 nm) for 5 min. Rinse the gels with PBS to remove excess sulfo-SANPAH. Pipette 50 µl of 0.2 mg/ml Collagen Type I solution (refer to point 1.4) into each well. Leave the plate covered at RT for at least 2 hr or O/N at 4 °C. NOTE: To speed up the process of collagen coating, a transfer pipette can be used to add the collagen solution. Typically, 1 – 2 droplets of solution should be enough to completely cover the gel surface. Leave the well plate at RT for at least 2 hr to allow collagen bonding. Rinse with PBS to remove excess collagen solution and sterilize under UV (λ = 200 nm) in a tissue culture hood for 2 hr. Soak the gels in complete medium (refer to section 4.1 for medium composition) O/N to hydrate and equilibrate. Use for cell seeding immediately or store in the fridge for up to 2 days. NOTE: Although typical for common mammalian cell lines, the protocol outlined in this section is specifically used with the breast cancer MDA-MB-231 cell line (see Figures 4 and 5). Collect cells from tissue culture flask by exposure to 5% trypsin/EDTA for 5 min at 37 °C. Use ~80 μl of trypsin/EDTA per each cm2 of culture flask area; for example, use 2 ml of trypsin/EDTA for a T25 cell culture flask. Re-suspend collected cells in complete medium supplemented with 10% fetal bovine serum (FBS) and 1% penicillin/streptomycin at a desired final cell concentration. Taking into account cell doubling time as well as the length of time the cells will be seeded on the assay, choose an appropriate sub-confluent cell concentration. Ensure that added medium is enough to completely submerge the hydrogels. NOTE: Since the hydrogels have been pre-equilibrated in media (refer to step 3.2.6) 100 μl volume should be sufficient. Typical medium volumes used for multiwell plates should be sufficient since the gels have been pre-equilibrated in media in the previous step. NOTE: The assay would be appropriate for any attachment-dependent cell type. Count cell number under an inverted microscope by using a hemacytometer. Load 10 µl of cell suspension into each hemacytometer port and average the cell count from at least 8 quadrants. To get the final cell concentration, multiply the cell count by 104. NOTE: Best cell count results are obtained when cell number in each hemacytometer quadrant is 20 – 50. Culture the cells onto the PA stiffness assay in a humidified incubator at 37 °C and 5% CO2. Change media every 2 – 3 days. Collect cells when needed by exposure to 5% trypsin/EDTA at 37 °C for 5 min. Use ~80 μl of trypsin/EDTA per cm2 of tissue culture flask. During all cell manipulation steps, take special care not to disrupt the hydrogel surface: aspirate or pipette medium by slightly tipping the multiwell plate sideways and touching the pipette tip onto the side wall of each well, as opposed to touching the hydrogel. NOTE: Except for taking special care not to damage the hydrogel surface during standard tissue culture handling, the cells seeded onto the stiffness assay can be manipulated the same way as if they were seeded onto a regular multiwell plate. Image cells directly on the PA stiffness assay. NOTE: Any microscope — inverted, fluorescent, or confocal, can be used for cell imaging. NOTE: The flexible plastic support used to construct the stiffness assay is fully transparent and does not autofluoresce or interfere with cell imaging. However, even though the flexible plastic support itself is transparent, imaging capabilities will be limited by the working distance of the objective. The flexible plastic support has a thickness of 0.23 mm and a typical working distance of a 10X objective is ~4 mm, sharply decreasing for higher magnifications. For live cell imaging, position PA stiffness assay in microscope plate holder and image. Keep imaging sessions under 2 hr, or use a microscope equipped with an environmental chamber for longer imaging times. When live cell imaging is not the goal, fix cells in 4% formaldehyde solution supplemented with 0.1% detergent. Soak cells in fixative at RT for a minimum of 2 hr. Rinse with PBS twice. Discard fixative waste in a designated waste container. NOTE: Cells can be imaged immediately or stored submerged in PBS at 4 °C for up to 2 weeks. CAUTION: Formaldehyde is toxic upon inhalation and contact. Handle with gloves in a chemical fume hood. NOTE: Cell fixation protocol has to be chosen based on the subsequent cell staining and handling protocols, because certain fixatives damage some cell proteins. For fluorescent imaging, stain fixed cells with desired cell stain directly in the multiwell plate. Image immediately. Circularity is measured on a scale of 0 – 1, where 0.6 – 1 were taken to designate rounded cells and 0 – 0.5 were taken to designate elongated cells. Approximately three hundred cells from at least three independent experiments were analyzed for each data point. Statistical differences were calculated based on single factor analysis of variance (ANOVA) where data sets were considered significantly different when p < 0.05. Figure 1. Schematic representation of polyacrylamide gel preparation on flexible plastic support. 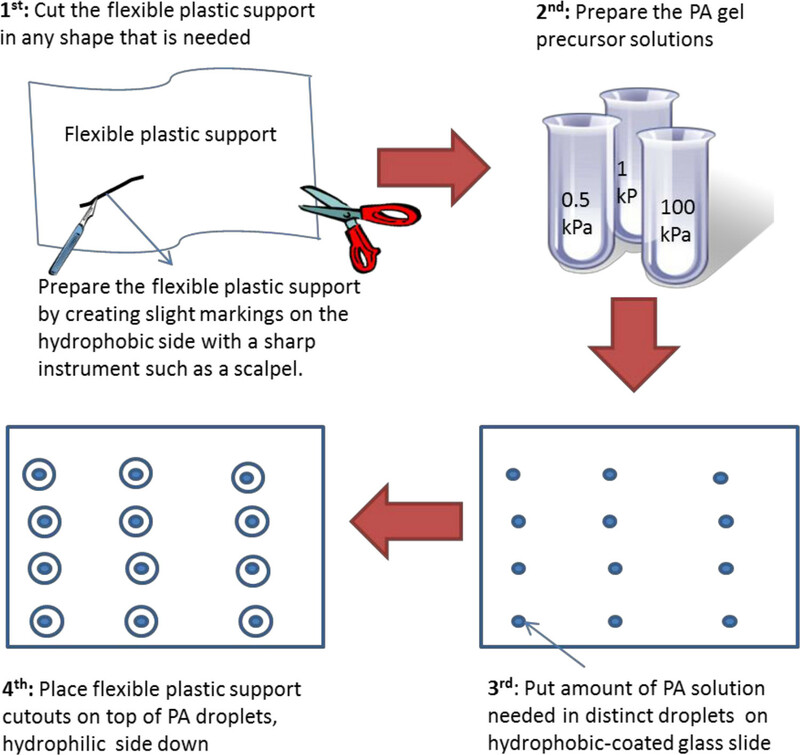 The figure represents the various steps involved in the preparation of PA gels on flexible plastic support. After the gel dries completely, it can be cut or punched into any desirable shape. A whole punch (~6 mm diameter) is most convenient when preparing gels for a 96-well plate, while a heavy-duty paper cutter can be used for square or rectangular shapes. The figure also highlights the edges of the wells, both with and without a gel, to demonstrate that complete well bottom coverage can be achieved with this method. Please click here to view a larger version of this figure. Figure 2. Stiffness of PA hydrogels as measured by rheology. (A) Representative Young’s modulus for five different A&B concentrations (refer to Table 1 for acronyms); (B) storage and loss modulus as a function of frequency as measured by rheology; (C) gels exhibit the same Young’s modulus initially (Initial) and after they have been dried and re-hydrated (Re-hydrated) independent of polymer precursor concentration. All gels for the rheology measurements were prepared as slabs of 20 mm diameter and 1 – 1.5 mm height (upon complete swelling). Figure 3. Collagen coating on PA gels. The collagen coating (green) is efficiently distributed and retained onto the PA gel (red) surface independent of hydrogel stiffness Young’s modulus). Collagen labeled with Cy5 was used for this data. Red-fluorescent beads were embedded into the PA hydrogel to aid visualization. Cross-sectional images were taken on a confocal microscope (scale bar = 100 μm). Image adapted from Zustiak et. al.5 Please click here to view a larger version of this figure. Figure 4. Phase contract (top row) and fluorescent (bottom row) images of MDA-MB-231 cells seeded on PA gels for 24 hr. MDA-MB-231 cells remain round on soft gels (Young’s modulus of 0.5 and 1 kPa) but elongate on stiff PA gels (Young’s modulus of 100 kPa). The cells were seeded on the gels for 24 hr, fixed in ethanol and stained with acridine orange (AO — green) to visualize the cell cytoplasm and DAPI (blue) to visualize cell nucleus; scale bar = 100 μm. Please click here to view a larger version of this figure. Figure 5. Cell spreading area and circularity are affected by the stiffness of the underlying substrate. (a) MDA-MB-231 cell spreading area is significantly increased on the 100 kPa as opposed to the 0.5 kPa gels. (b) Cell circularity decreases with increase in PA gel stiffness. Asterisks designate significant differences; p < 0.05. Figure 6. Schematic representation of an alternative polyacrylamide gel preparation on flexible plastic support. The figure represents the various steps involved in the preparation of PA gels on flexible plastic support. Here the flexible plastic support is initially pre-cut into plastic “coverslips” of a desired shape and size. This technique works best for soft hydrogels. Please click here to view a larger version of this figure. Table 1. Concentrations of acrylamide (A) and crosslinker bis-acrylamide (B) and the resultant PA gel stiffness. Stiffness, represented here by G’ and E, was measured by rheology. G’ is the storage modulus at 1 Hz frequency. Young’s modulus, E, was calculated from Eq. 1. Standard deviation (SD) was calculated based on three independent experiments with 3-5 samples measured per experiment. The acronyms in the table correspond to the acronyms used in Figure 2A. Table 2. UV polymerization is an alternative and a quicker method for PA gel preparation when gelation conditions are optimized; PA3 (refer to Table 1) gel is depicted. The table summarizes the resultant Young’s modulus when either exposure time (left two columns) or UV intensity (right two columns) are varied for the same solution. Based on the results from the table, it appears that 300 sec exposure time and 15 mW/cm2 UV intensity give the highest PA gel stiffness, which is comparable to the stiffness of the traditionally polymerized gel as reported in Table 1. The technique depicted in this article, satisfies all of the above requirements allowing the mass production of uniform PA gels of custom size and shape. The technique is simpler and more efficient than the current standard of sandwiching PA gel precursor solution between two glass coverslips. Furthermore, it does not require any sophisticated equipment and thus is easily adoptable by any research laboratory. It is also more cost effective as it does not necessitate the use of glass plates or glass coverslips, which are not only costly, but also come in limited sizes. The technique is also quicker for several reasons. First, it does not involve any pretreatment steps typical for glass surfaces since the flexible plastic support is designed with two distinct surfaces — a hydrophilic side that permanently attaches to polyacrylamide and a hydrophobic side that could be easily peeled off after gel formation. Second, because the plastic support is flexible, it is easier and faster to peel off the formed gel: when thin gels are formed between two glass slides, peeling off the top hydrophobic slide is difficult and often results in breakage which also compromises the gel. Lastly, because of the flexible plastic support transparency, faster UV polymerization can be employed as opposed to the standard TEMED-based polymerization which could take as much as 45 min (Table 2). The data in Table 2 demonstrates that when polymerization time and UV light intensity are optimized similar stiffness can be achieved by both TEMED and UV polymerization methods. The hydrogels are prepared on flexible plastic support as depicted on Figure 1. It is recommended to perform the gelation in a degassing chamber to avoid incomplete polymerization of the gel edges (i.e., edge effects) due to oxygen diffusion between the two surfaces that sandwich the polymer solution. The goal is to create a large hydrogel film on top of the flexible plastic support, thus, glass plate of any size would be appropriate, but it will dictate the size of polyacrylamide film that can be achieved. The glass can be coated with any hydrophobic coating or alternatively, the hydrophobic side of the flexible plastic support could be used instead. Once a PA gel film is formed, it is dried, cut into desired shapes, and then re-hydrated prior to usage. When dry, the gels can be stored indefinitely. It was confirmed by rheology, that the PA gel stiffness is unchanged upon rehydration even when the gels are stored in the dry state for several months (Figure 2C). However, for very soft gels (≤ 1 kPa in Young’s modulus) drying and re-hydration exacerbate surface creasing and crack formation. This behavior is common for soft gels that undergo de-hydration and subsequent re-hydration while being geometrically constrained.34,35 Not all gels crease or crack, thus, it is possible to visually examine the hydrogels prior to use and only use the samples that display a smooth surface. To completely avoid crease formation and cracking, an alternative method to prepare soft hydrogels is depicted on Figure 6. Here, the flexible plastic support is pre-cut in the desired shape and the PA gel is formed on top, thus, the gels do not need to be de-hydrated but can be used as prepared. An added benefit of this alternative strategy is that ~2.5 more gels can be produced from the same volume of hydrogel precursor solution (the estimate is based on preparing gels for a standard 96-well plate as described in the protocol section). One caution when preparing hydrogels in this manner is to take care to avoid oxygen infiltration, especially for gels of smaller size (e.g., gels to be used in a 96-well plate). Even when the gel precursor solution is completely degassed, i.e., oxygen free, oxygen will be diffusing between the two surfaces that sandwich the PA solution. Thus, in order to avoid edge effects or incomplete gel formation along the edges, it is best to allow the polymerization to happen in the absence of oxygen. In our experience, a vacuum chamber works well, even though an inert gas environment could be used with equal success. One final caution when preparing PA hydrogels as cell substrates to test stiffness-dependent cell responses, is that the thickness of the resultant hydrogel is important: for very thin gels, the cells are able to sense the underlying substrate.36 Using theory and experiment, Lin et al. demonstrated that the depth at which cells can feel the underlying substrate is dependent on the lateral dimension of the cell.29 Since current research is contradictory, identifying the minimum required thickness to prevent the cells from sensing the “hidden” substrate to be from several microns36 to as much as 60 microns,37 a minimum gel thickness of 100 μm should be aimed for. When assembling the PA gels into a multiwell plate, a small droplet of PDMS is used to secure the gel to the bottom of the well. PDMS was chosen because it acts as permanent glue upon hardening, it is completely transparent and does not interfere with subsequent microscopy experiments, it is fully non-cytotoxic, and it cures in approximately 4 – 8 hr leaving sufficient time for plate assembly. Safely securing the hydrogels to the bottom of the well aids in cell handling: for example, vigorous washing could dislodge hydrogels if not firmly secured. If frequent change in cell media is not a concern, then the gels could be temporarily secured to the well surface by a small droplet of a non-cytotoxic and highly viscous liquid such as glycerin. The final steps before cell seeding involve ECM coating of the gel and then sterilization. Here Collagen Type I coating is depicted (Figure 3) even though the same technique can be applied for any other ECM protein. The bi-functional crosslinker sulfo-SANPAH is utilized to achieve an even monolayer coat. Previous research has demonstrated that such covalent attachment yields a more uniform coating than simple protein adsorption and also allows for a 12-fold tuning of the amount of protein attached by simply using a protein solution of varying concentration.6 Lastly, the assembled multiwell gel plate is sterilized under UV in the tissue culture hood for up to 2 hr. The UV sterilization allows for the assay to be assembled on a laboratory bench outside the hood, which makes the process logistically simpler and overall faster. 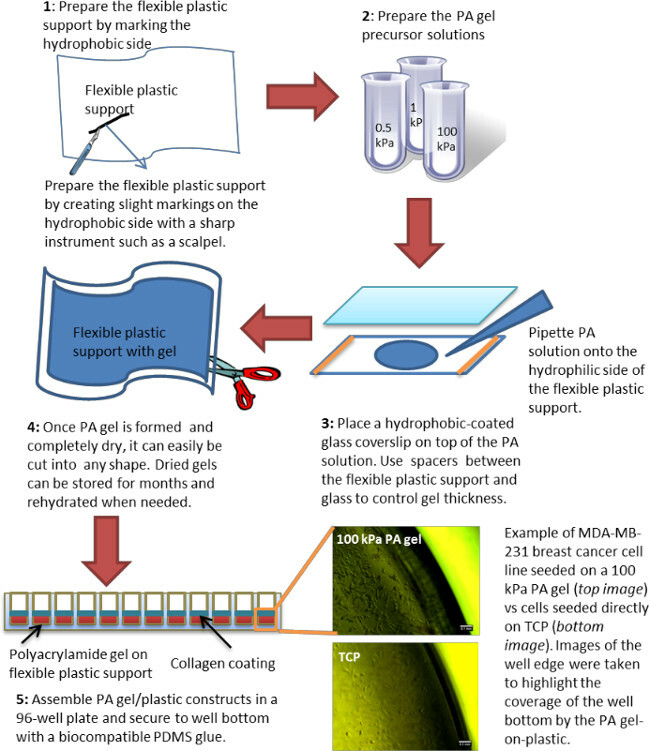 Figures 4 and 5 illustrate some representative results from MDA-MB-231 breast cancer cells cultured on flexible plastic support-attached PA gels of varying stiffness. MDA-MB-231 cells were chosen to demonstrate the method utility because they have been shown to react to the underlying substrate stiffness by measurable changes in their morphology.5,12 As expected, the cells were more elongated and had a larger spreading area on the stiff 100 kPa PA gels compared to the soft 0.5 and 1 kPa PA gels (Figures 4 and 5). The bottom row on Figure 4 also demonstrates the use of two fluorescent dyes that stain the cell nucleus and cell cytoplasm, showcasing the fact that the flexible plastic support does not interfere with fluorescent microscope imaging. In summary, a simple method to prepare polyacrylamide hydrogels in a multiwell plate format is presented. The technique is faster, more efficient, and less costly than current methods for preparing PA gels to be used as cell substrates as well as enables the preparation of gels of custom sizes not otherwise available. As it doesn’t require any specialized equipment, the method could be easily adopted by any research laboratory and would be particularly useful in research focused on understanding stiffness-dependent cell responses. This work was funded by start-up funds provided to Dr. Silviya Zustiak by Saint Louis University as well as by a President’s Research Fund (PRF) grant awarded to Dr. Silviya Zustiak by Saint Louis University. We thank Naveed Ahmed and Keval Shah for technical assistance. Levental, I., Georges, P. C., Janmey, P. A. Soft biological materials and their impact on cell function. Soft Matter. 3, 299-306 (2007). Minton, K. Mechanotransduction: A stiff response. Nature Reviews Molecular Cell Biology. 15, (8), 500-500 (2014). Yeung, T., et al. Effects of substrate stiffness on cell morphology, cytoskeletal structure, and adhesion. Cell motility and the cytoskeleton. 60, (1), 24-34 (2005). Watt, F. M., Huck, W. T. Role of the extracellular matrix in regulating stem cell fate. Nature Reviews Molecular Cell Biology. 14, (8), 467-473 (2013). Zustiak, S., Nossal, R., Sackett, D. L. Multiwell stiffness assay for the study of cell responsiveness to cytotoxic drugs. Biotechnology and bioengineering. 111, (2), (2014). Mih, J. D., et al. A multiwell platform for studying stiffness-dependent cell biology. PLoS One. 6, (5), e19929 (2011). Sunyer, R., Jin, A. J., Nossal, R., Sackett, D. L. Fabrication of hydrogels with steep stiffness gradients for studying cell mechanical response. PloS one. 7, (10), e46107 (2012). Herrick, W. G., et al. PEG-phosphorylcholine hydrogels as tunable and versatile platforms for mechanobiology. Biomacromolecules. 14, (7), 2294-2304 (2013). Tokuda, E. Y., Leight, J. L., Anseth, K. S. Modulation of matrix elasticity with PEG hydrogels to study melanoma drug responsiveness. Biomaterials. 35, (14), 4310-4318 (2014). Feng, J., et al. Substrate stiffness influences the outcome of antitumor drug screening in vitro. Clinical hemorheology and microcirculation. 55, (1), 121-131 (2013). Ramamoorthi, K., Hara, J., Ito, C., Asuri, P. Role of Three-Dimensional Matrix Stiffness in Regulating the Response of Human Neural Cells to Toxins. Cellular and Molecular Bioengineering. 7, (2), 1-7 (2014). Tilghman, R. W., et al. Matrix rigidity regulates cancer cell growth and cellular phenotype. PloS one. 5, (9), e12905 (2010). Gobaa, S., et al. Artificial niche microarrays for probing single stem cell fate in high throughput. Nature methods. 8, (11), 949-955 (2011). Kumachev, A., et al. High-throughput generation of hydrogel microbeads with varying elasticity for cell encapsulation. Biomaterials. 32, (6), 1477-1483 (2011). Fu, J., et al. Mechanical regulation of cell function with geometrically modulated elastomeric substrates. Nature Methods. 7, (9), 733-736 (2010). Pelham, R. J., Wang, Y. Cell locomotion and focal adhesions are regulated by substrate flexibility. Proc Natl Acad Sci U S A. 94, (25), 13661-13665 (1997). Tse, J. R., Engler, A. J., et al. Preparation of hydrogel substrates with tunable mechanical properties. Current protocols in cell biology / editorial board, Juan S. Bonifacino ... [et al.]. 10, (Unit 10 16), (2010). Lo, C. -M., Wang, H. -B., Dembo, M., Wang, Y. -l Cell movement is guided by the rigidity of the substrate. Biophysical journal. 79, (1), 144-152 (2000). Discher, D. E., Janmey, P., Wang, Y. 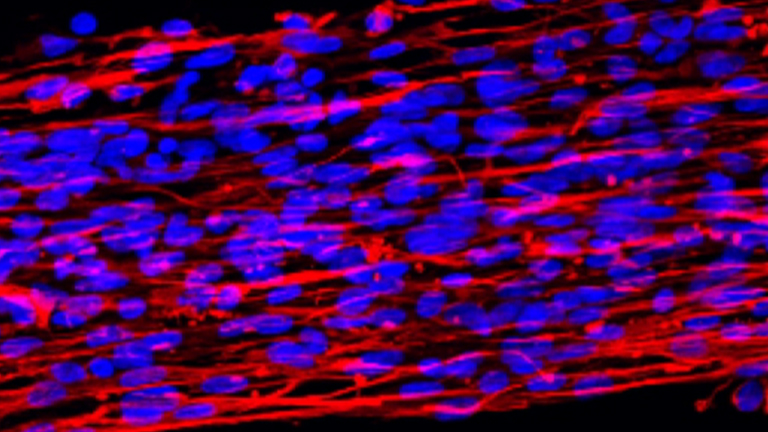 -l Tissue cells feel and respond to the stiffness of their substrate. Science. 310, (5751), 1139-1143 (2005). Young, D. A., Choi, Y. S., Engler, A. J., Christman, K. L. Stimulation of adipogenesis of adult adipose-derived stem cells using substrates that mimic the stiffness of adipose tissue. Biomaterials. 34, (34), 8581-8588 (2013). Semler, E. J., Lancin, P. A., Dasgupta, A., Moghe, P. V. Engineering hepatocellular morphogenesis and function via ligand-presenting hydrogels with graded mechanical compliance. Biotechnology Bioengineering. 89, (3), 296-307 (2005). Reinhart-King, C. A., Dembo, M., Hammer, D. A. Cell-cell mechanical communication through compliant substrates. Biophysical journal. 95, (12), 6044-6051 (2008). Fischer, R. S., Myers, K. A., Gardel, M. L., Waterman, C. M. Stiffness-controlled three-dimensional extracellular matrices for high-resolution imaging of cell behavior. Nature protocols. 7, (11), 2056-2066 (2012). Quinlan, A. M., Billiar, K. L. Investigating the role of substrate stiffness in the persistence of valvular interstitial cell activation. Journal of Biomedical Materials Research Part A. 100, (9), 2474-2482 (2012). Zustiak, S. P., Leach, J. B. Hydrolytically degradable poly(ethylene glycol) hydrogel scaffolds with tunable degradation and mechanical properties. Biomacromolecules. 11, (5), 1348-1357 (2010). Chrambach, A., Rodbard, D. Polyacrylamide gel electrophoresis. Science. 172, (3982), 440-451 (1971). Lin, Y. C., et al. Mechanosensing of substrate thickness. Physical review. E, Statistical, nonlinear, and soft matter physics. 82, (4), 041918 (2010). Chrambach, A. The Practice of Quantitative Gel Electrophoresis. (1985). Sagvolden, G., Giaever, I., Pettersen, E. O., Feder, J. Cell adhesion force microscopy. Proceedings of the National Academy of Sciences of the United States of America. 96, (2), 471-476 (1999). Javaherian, S., Li, K. J., McGuigan, A. P. A simple and rapid method for generating patterned co-cultures with stable interfaces. BioTechniques. 55, (1), 21-26 (2013). Tarone, G., Galetto, G., Prat, M., Comoglio, P. M. Cell surface molecules and fibronectin-mediated cell adhesion: effect of proteolytic digestion of membrane proteins. The Journal of cell biology. 94, (1), 179-186 (1982). Trujillo, V., Kim, J., Hayward, R. C. Creasing instability of surface-attached hydrogels. Soft Matter. 4, (3), 564-569 (2008). Saha, K., et al. Surface creasing instability of soft polyacrylamide cell culture substrates. Biophysical journal. 99, (12), L94-L96 (2010). Buxboim, A., Rajagopal, K., Andre’EX, B., Discher, D. E. How deeply cells feel: methods for thin gels. Journal of Physics: Condensed Matter. 22, (19), 194116 (2010). Merkel, R., Kirchgessner, N., Cesa, C. M., Hoffmann, B. Cell force microscopy on elastic layers of finite thickness. Biophysical journal. 93, (9), 3314-3323 (2007).